The Shahrouks share their deliciously easy and budget-friendly take on a hugely popular Levant dessert, knafeh. Traditionally a sweet cheese pastry, the sisters' version ditches heavy unsalted mozzarella for a lighter custard mixture, and swaps out kataifi pastry for a simple but genius crushed Cornflake crust. Slather in their homemade orange blossom and rose water syrup and you're in heaven. 1. Smear two serving platters/trays (approximately 30cm x 25cm x 4cm) with unsalted butter, then dust surface with Cornflake crumbs. 1. Combine all ingredients in a large pot and stir to combine. Place pot over a high heat setting and cook, stirring constantly. Bring mixture to the boil. 2. Continue to cook until mixture thickens, approximatey 15 minutes, and pour immediately into prepared trays. 3. Dust with another layer of Cornflake crumbs, and leave on the counter for approximately ½-1 hour to set. 1. Place all ingredients in a medium saucepan and bring to the boil, stirring sugar to dissolve. 2. Reduce to a medium heat and cook for 8 minutes or until mixture thickens — you can test if mixture is ready by coating a spoon with syrup, and if the spoon sticks to a plate, it's ready. 1. Once the knafeh mixture is set, sprinkle with crushed pistachio, and drizzle with syrup. Serve immediately. - If you have time, before sprinkling nuts, scatter with small dollops of unsalted butter and bake in oven for a further 8-10 minutes. 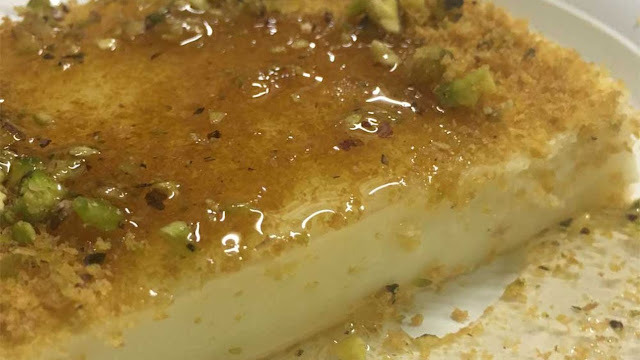 Image and recipe courtesy of the Shahrouk sisters and Family Food Fight.